With cookie party season upon us I’m having a great time sharing some of our family favorites on my blog site. 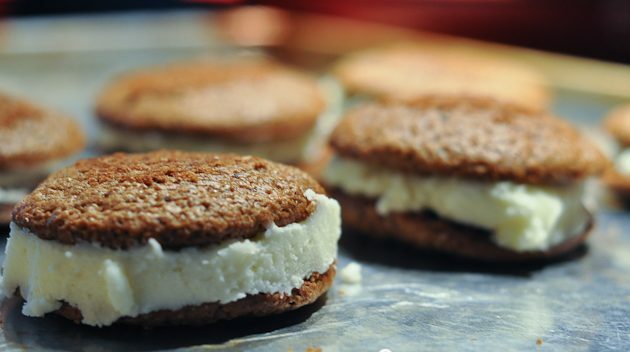 This Whoopie Pie recipe will give you a sugar rush while filling your home with the scent of gingerbread. What’s not to love about that?! Cream the butter and brown sugar together in a large mixing bowl until light and fluffy. Add the egg and vanilla and beat until blended. In a medium bowl, combine the flour, cinnamon, ginger, baking soda, salt, and nutmeg; set aside. In a small bowl, combine the oil, molasses, and sour cream. Alternately mix the flour mixture and molasses mixture into the creamed butter just until combined. Drop 2 tablespoons of batter about 2 inches apart on the baking sheet. Bake for 14 – 16 minutes or until they spring back when touched in the center. Cool completely on a wire rack before you add the filling. In a large mixing bowl, beat the butter and confectioner’s sugar on medium speed until fluffy. Add the vanilla, salt, and Marshmallow until combined. Add a rounded tablespoon of the filling on the center of the flat side of the cake-like cookie. Top with the flat side of another cookie and press together slightly. What are your favorite gingerbread recipes? I’d love to hear from you so be sure to comment below. I love whoopie pies! I will be trying this recipe over the Christmas break and I want to thank you for sharing this. I hope you stop by and let me know what you think of the recipe. Merry Christmas!